Inappropriately used prescription pain medications kill 15,000 people in the United States each year, according to a new report released by the Centers for Disease Control and Prevention. "We're in the midst of an epidemic," says CDC Director Dr. Thomas Frieden. "Narcotics prescribed by physicians kill 40 people per day." Deaths due to prescription painkiller overdoses now exceed the number of heroin and cocaine overdose deaths combined, says Frieden, who is joining Gil Kerlikowske, the director of National Drug Control Policy, also known as the nation's drug czar, to raise awareness about how prescription drug abuse deaths have tripled since 1999. 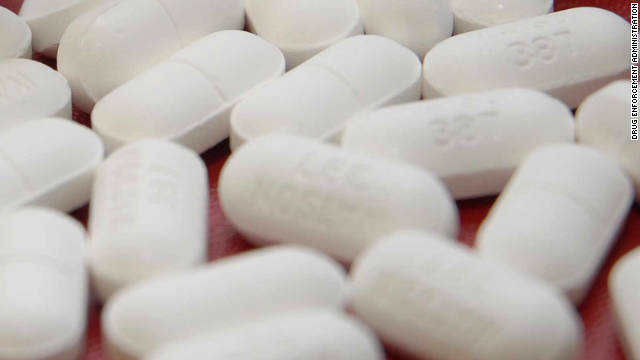 According to the data released Tuesday, 1 in 20 or 12 million Americans age 12 and older has misused prescription painkillers like oxycodone (Oxycotin), methadone or hydrocodone (Vicodin) and middle-aged adults have the highest overdose rates. Health officials say that enough prescription painkillers were prescribed last year to medicate every adult every four hours for an entire month, and this type of drug abuse is costing insurance companies up to $72.5 million each year. Just a few months ago, the CDC reported that opioid pain medication abuse accounts for the most common poisonings treated in emergency departments and nearly 1 million people in the United States are currently addicted to some type of opiates. Kerlikowske calls prescription drug abuse "our nation's largest drug problems," which he recognizes can't be solved overnight. More needs to be done, he said, to reduce the number of people starting to abuse prescription painkillers, which stands at about 5,500 each day, according to the Substance Abuse and Mental Health Services Administration. Only Missouri and New Hampshire haven't set up prescription monitoring programs, electronic databases that track all painkiller prescriptions in that state. Improving these monitoring systems and making them easily accessible to physicians and pharmacists in other states could allow easier spotting of a red flag if someone is trying to get multiple prescriptions from multiple doctors or pharmacies. States could also do more to shut down so-called "pill mills," where doctors or pharmacists inappropriately dispense these type of drugs. Doctors should also screen their patients for substance abuse or mental illness, the CDC suggests, to prevent someone from getting addicted to these drugs. Also, physicians are encouraged to only prescribe the appropriate amount of painkiller, if necessary. So if someone needs only three days' worth of Vicodin for example, don't prescribe a 30-day supply. Kerlikowske hopes that if appropriate measures are taken at the federal, state and local level, this drug abuse epidemic can be reduced by 15% in the next few years. I have to agree... Marijuana is better than any of the current pain medications! It also has NO proven dangers! There is not even a debate about this. Marijuana can't kill you. To bad a primary side effect of cannabis is independent thought and questioning of authority. Conservatives and big business are scared to death by that. here lies the problem with it.. it has 3 times as much tar as tobacco. The only reason you haven't seen the longer term effects is because not many can afford to smoke the equivalant of 3 packs a day. make it legal and you would see a much greater increase in cancers of throat/lung/mouth.etc. Now don't get me wrong..i am all for legalization..but to fool yourself into thinking ingesting any type of smoke into your body won't harm you? Add in increased heart rate and you would also see an increase in heart failure among many new users if it went mainstream. @Rob- Those who are going to do it already do. And there are other delivery methods available that are way less harmful than smoking. Vaporize it!! Eat it!! @Common Sense: MJ can also be taken orally and via vaporizers - which remove a lot of the toxic/carcinogenic chemicals of smoke. So I don't think Joe is implying anything about smoking not being dangerous. both my parents and all my sibling died from smoking too much pot. @sad: Your parents and siblings must have been the first reported case of OD from marijuana in the history of mankind then. Somehow, I think there's more to the story. vaporizers and edible thc foods aren't dangerous to your lungs. So really the only argument is that Marijuana can impair your response time (this is true, even stoners must admit) and people may get high and go on the roads driving. Personally I think I drive better when im baked but others may not. However, alcohol slows your response time even more yet that is legal, with thousands of people driving drunk every day. So as long as cigs and alc are legal there is really no valid reason that weed should be illegal. My theory? Politicians receive millions of dollars in lobbyist money from cig and alcohol companies. Yep, marijuana is better....I concur. my mother died from being overprescribed by doctors who, rather than be of any real help, relied on the script pad far too often. i truly loathe big pharma. they robbed me of my mother. So why do you hate "big pharma"? Shouldn't you hate doctors? If I shot your mother, would you blame gun manufactirers? @Daniel: Because gun manufacturers don't (at least to my knowledge) advocate laws against safer alternatives like big pharma does. Plus, this is the medical field - people are supposed to be concerned for the healthy and safety of other people, not for their wallets. Maybe someone should start a war on prescription drugs and lay off persecuting cannabis. What do you expect when safer alternatives are illegal! Opioid drugs can drastically improve the quality of life of people in severe pain, and in low doses are much safer than common non-prescription products used for pain, such as acetaminophen and ibuprofen. Most prescription drugs containing opioid analgesics are combined with acetaminophen, which is a major cause of liver damage or failure with chronic or high dose use. Liver damage or failure is an even bigger risk when combined with alcohol, even small amounts. In most countries outside the United States, including Canada, at least some form of opioid drug is available without a prescription, usually low dose codeine products. Used on their own, without acetaminophen, opioid drugs are considerably less harmful than alcohol and are safe alternatives to non-narcotic pain relief drugs. The best approach would be to prohibit the combination drugs that have been encouraged by law and to make at least some low dose opioid products available to adults without a prescription. Informing the public of the dangers of excessive or frequent use of acetaminophen should be a priority for all physicians and pharmacists who prescribe and dispense these drugs. Many people are unaware of the risk. I agree that combining acetaminophen with opiates is unconscionable. It is unbelievable that this continues. However, low dose opiates are addictive. People with chronic pain who treat it with opiates end up needing more and more, and find themselves eventually taking large doses regularly. It's a heartbreaking fact that we have no better way to treat chronic pain. If MJ was really effective for chronic pain, it would be a crime not to use it for treatment. I suffer from occasional bouts of severe, disabling lower back pain. The only medication that eases my agony is Vicoden. I usually can get significant relief by taking one Vicoden in conjunction with two to four Tylenol. Yes, I know the addition of acetaminophen is not recommended, but the total dose of acetaminophen is still less than the recommended daily dosage. I never have had to extend my treatment more than two days. My doctor is particularly parsimonious and refuses to give me a prescription for more than 28 Vicoden tablets at a time. Twenty-eight tablets usually lasts me for 3-4 months, so I can truthfully say that I am not addicted to Vicoden. However, I view with concern the fact that the medical profession will so restrict the use of Vicoden that I will have to make a doctor's visit every time my back acts up just to get a couple of pills. A stupid waste of my and my doctor's time. Tylenol is now the 2nd leading cause of liver disease. So all you are doing is changing one type of problem for another later in life. Try a chiropractor or accu. Great results. ...or you could try Chiropractic or Physical therapy (both proven to have better long term results then pain medication)…take charge of your health and stop relying on medication to mask your pain! The reason your doctor won't prescribe more than 28 at a time and no refills is because state and federal laws regarding controlled substances require that you be seen by the physician for each prescription and restrict the amount he can prescribe. Most controlled substances can only be prescribed for 30 days at a time. If a physician prescribes too many to a patient, the DEA can suspend or revoke their ability to write any prescriptions because of concerns about drug trafficking or physicians being bribed to prescribe large amounts for abusers or dealers. Severe pain is a killer and unfortunately your doctor is probably limiting your supply due to fear of prosecution by the DEA. It is a very sad state that sick people are treated this way. I used to have back pain and I am sure that mine was not considered to be severe but it made standing up from a sitting position very hard to do. I was able to eliminate my back pain by doing exercise. The best exercise that I found was doing push-ups. I started with wall push-up and slowly went lower and lower until I was able to do push-ups on the floor. I did not start doing the push-ups to eliminate the back pain but found that after doing them for several weeks that the back pain had disappeared. I have also read that doing yoga will help back pain. I wish you the best because I know how back pain can dominate your life. The numbers they have here are low. This only states misuse and does not consider death from proper use. Big Pharma whould not want you to know about that. Death from "proper" use is the real issue that is rarely addressed. My wife of 32 years died in her sleep in August after "proper" use as prescribed for a duration of over 4 years. Her crime? trusting her providers' competance. Big Pharma provides selected research reports to providers that obviously support the prescribing of their products. And the doctors are hesitant to acknowledge that their "treatment" as become their patient's primary medical condition. My husband was prescribed vioodin for hip pain and he LITERALLY slept ALL day. He refused to take any more after taking just 1 pill. My dentist prescribed it for a pulled tooth. I never filled it and turns out a few advil was all I needed for the pain. What's wrong with doctor's throwing around these prescription drugs?? My mother works in a drug rehab hospital in WI and their most common client is a 17-29 yr old suburban white male addicted to Heroin. They are addicted to heroin because it is cheaper and they receive the same high as the prescription painkillers. Marijuana is not a gateway drug, prescrptiopn painkillers are! why don't all drugs have to play by the same rules? If it's highly addictive and it kills people why isn't it outlawed. Example nicotine, prescription drugs. It's time the people that started making these rules followed them. It's the abuse of drugs that kills people. All drugs can be abused. Even abuse of vitamins could kill someone. Outlawing drugs makes the problems worse. Then you put the business in the hands of cartels and drug dealers, and people get even more hooked and addicted to them. Not to mention, they are needlessly made into criminals. Sarah – vitamins are extremely safe. Aspirin kills about 50 people a year. Look up Andrew W. Saul, PhD Nutrition. My sister died of a presciption overdose. She was taking so many meds and then the doctor gave her a morphine patch on top of the other things to ease her back pain. Everything slowed her organs down and then she went to sleep with a new morphine patch on curled up in warm blankets. The patch dissolved in a higher rate of execution because of the warmth and with the other meds already in her system her heart stopped. I have been angry for ten years that the medical and government communities can't get it together to regulate this stuff. 2 doctors giving out different meds and no one including the pharmacies communicate to each other on one patient. They all site patient privacy. There you go. It comes straight from the top. Pharmaceutical manufacturers and the FDA getting their pockets lined from those same companies. Legal drug pushing for the big guys and murder for the unsuspecting public. I take Ultram (Tramadol) for my herniated disc. Works pretty well, doesn't make me sleepy or high either, which is great since I can function normally on them. I had some of that prescribed to me for a sprained ankle. Did the job and didn't make me drowsy. I'm a cop so I wasn't able to do my normal job while I was on it (bad idea mixing guns and meds) but I could still drive to work and be at least a little bit productive on it. Ultram/Tramadol is also associated with seizures. Be aware and careful. Doctors over prescribing is part of the issue, but most are heavily influenced by the Pharmaceutical representatives. They are the ones that create back door deals and incentives for the doctors to over prescribe the medications in the first place. Why are aggressive sales and direct marketing tactics needed to promote drugs into the market place? Find out what day of the week your doctor accepts visits from Pharmaceutical reps sales calls and visit the office during that time. You will be AMAZED at how many suits are in the waiting room delivering samples, sports tickets, catered food for the entire office, free dinners, vacations, CARS.......Even the best doctors can be innocently exposed to corruption. Drug reps aren't allowed to give out so much as a pen or a hat these days. It's all considered coercion and it's forbidden by law. My best friend is a drug rep. Try to keep up with the new regulations. Yup. blame it on the public. It's the drug companies and the FDA!! Just look at the warnings about prescription drugs. The FDA will pass anything as long as the drug companies pay them enough. And look at the perks the doctors receive from those pharmaceuticals for pushing them. It's government and greed causing most of these deaths. Talk about drug cartels. We have the two biggest ones working legally right here in the good old US of A!! I know this won't be published on here so it's going straight to Letters to the Editor of a whole lot of newspapers. Wow, what a shocking discovery. Maybe advertising drugs on TV to people instead of doctors isn't such a great idea afterall. Really! However, it's a great marketing tool. Just ask your doc. You would be amazed by the numbers of people who actually ask their doc to prescribe some medicine they no nothing about. Handing out drugs is a serious business. Following the prescription is also important. I have relatives and a best friend who think they know better than than doctor. They think it's okay to take a pain pill when they feel like it. I would love to see all these people who are so opposed to Rx pain medications suffer just one week from chronic pain. I will guarantee at the end of that week they would be singing a different song. Due to two accidents, I take Hydrocodone 4 times a day. If i didn't take that med I wouldn't even be able to get out of bed. The med at least allows me to have some quality of life for which I am very greatful. Same here. I've tried everything, and I do physical therapy which is painful, all so I can still have a few hours per day where I can contribute something to my family. Without hydrocodone, I would probably have killed myself long ago – it makes that much difference. as a sufferer of chronic back pain from neck to hips, with surgical procedures not an option, gone thru nerve ablations and cortisones, how is one supposed to continue to continue to work – as to apply and be accepted for Disability (totally unable to walk or move without massive doses of aspirin and about 5 vicodin a day.....) and I don't want to live under a bridge...I pay all my bills and taxes, and what I take is maybe- addictive but keeps me productive...I take no more no less than this tho i take it daily...to be productive...and still suffer days on ice packs and heat...pain meds have their uses, and tho some people use the incorrectly or to get high, others of us need them to survive, to remain productive, and have no other alternatives. I know I'm not the only one here that wishes Sarah Palin would weigh in on this one. I believe she's the only one smart enough to put the "marijuana debate" into proper perspective for all of us. One of the main problems in our complete disregard for our health. The general population wants to treat their bodies like a car…and when it’s not working properly, they want to drop it off at the doctor’s office to have it ”fixed”…I wonder: how many people who “live with chronic pain” have tried more conservative treatments…like maybe taking off the extra 50 lbs or exercising…Chiropractic or even physical therapy…it’s time for us to take charge of our health, and stop masking our pain! here is the biggest problem with opiate painkillers..people are given them for cetain pain (ex. after a surgery) however the drug help with currently existing pain..no more back ache..no more knee pain..arthritis stops hurting..headaches are gone. Now you might feel great for a few weeks until you are off the meds for an existing injury..all of a sudden wham..back aches. kneees ache..headache..arthritis......everything is back to normal. unfortuantely it is easy to see why some people get hooked on heroin.or prescribed meds..they simply don't want th pain anymore. Prescription drug abuse is just another manifestation of the "war on drugs". Rather than use something much safer but illegal our government in combination with the pharmaceutical industry has forced the poisoning of hundreds of thousands through toxic levels of acetominophen combined with the opiate. The opiate is not causing the damage but the tylenol sure as hell is. Granted one can overdose from high levels of opiates but this is not the cause of emergency rooms filling up it's the liver damage from acetominophen. Jeez we are such a stupid nation! I am sorry but if you think that it is liver failure that is causing these deaths then you are wrong, yes this is a problem with the acetominophen in the drugs but it IS the opioids and opiates that are causing the deaths. period. "acetaminophen overdose is one the most common causes of OTC drug poisoning in the United States and Britain. More than 30,000 cases per year of acetaminophen overdose are reported to the American Association of Poison Control Centers (Bartlett D 2004). It is a leading cause of liver failure in the Western world and the leading cause of drug-induced liver failure in the United States (Bartlett D 2004). " Sorry Getthefacts, but it isn't true, period. When the article states that prescription pain killers are responsible for more deaths than heroin and cocaine combined you have to ask yourself what is so different about prescription opiates versus heroin. The difference is that most of the prescribed opiates have acetominophen added or sometimes ibuprophin (this was intended by the drug companies to curb the abuse of the drug). Most of these prescriptions have much lower unit doses of opiates than the average heroin user receives yet their death rate is far less, why??? Yes you can obviously overdose on legal opiates but I stick to my statement, it's the acetominophen that's doing the killing! Once again the media in its ever endless liberal amount of wisdom, puts this on the doctor/medical profession. When they restricted ephedrine (the stuff used to make meth) only made it so that the law abiding citizen had to jump through more hoops to get a good nasal drug. If you are going to support legalizing drugs, then you must expect more people to socially accept drug experimentation, use, and addiction. This is on the liberals heads. If we expect doctors to change it will only impact the law abiding NON DRUG USERS! If you support drug use then this is really in part your fault. It is liberal policies that increase drug use, not restrictions on the responsible use of it. You make a giant leap in logic when you state "if you support legalizing drugs you have to accept increased social experimentation, use and addiction". I disagree with that bent form of thinking. While use of recently legalized drugs might increase somewhat initially I think you would find the long term results would actually be less abuse, less crime, less toxicity cases coming into the emrgency room. Those people inclined to use drugs illegal or otherwise are already using them and there are no facts out there to support your claim that use increases with legalization of drugs, in fact quite the opposite has occurred in those nations choosing to pursue more enlightened policies. It's time we stop letting unproven, unfounded fear guide our public policies to the detriment of the nation as a whole. I live in Missouri and it's obvious that they seriously need to implement the prescription monitoring system. I live in PA, we've been doing it for years. They still find meth houses in my small, quaint town every year. It doesn't help. If people have the right to drink themselves to death, then why not drug themselves to death. We tried prohibition with alcohol and now with "illegal" drugs. It doesn't work. The fact is, the more controls you put on something the harder you make it for normal people to obtain and use a product. This is not going to make it any harder to steal a pack of Sudafed from you local CVS. Also, doctors are not going to stop prescribing painkillers because they not only get a kick back from drug companies but because they don't have anything else to offer. The FDA failed, bad drugs are legalized daily only to be taken off the market years later for killing people. I have been on opiates (morphine) for 7 years,along with a breakthrough (if needed).This is for a back surgery that went wrong. My doctors make sure that I am taken care of.I have to have a primary care doctor. (only one),only one drug store that I use and have to have drug screens done regular,liver panels every thing that goes with taking care of his patients.If you need the medication you will use it as it is directed. I signed a contract with DEA and live by that contract.I believe that all doctors that give these medications should be under these contracts.The DEA comes into his office and pulls files at random.he has not been fined or put on probation.His office is connected to the DEA so that any patient goes anywhere else they found out.Every doctor should be connceted NOW.It would not be so hard for the people that really need them. Fat, stupid, and on drugs. What else is new? "America's largest drug problem" is with man-made drugs created in yet we waste millions on the "drug war" that puts innocent people in jail for victimless crimes. I'm a criminal for growing my own marijuana ( I like to know where my stuff comes from) for my sleep problems and anxiety. A model citizen is suppose to take prescription drugs coming from who knows where and that have been known to kill 40 people per day and not question the authority. Eat what they feed you. That's right CDC,more people die from alcohol and swimming related deaths then pain med addiction..Let's ban swimming pools or alcohol next!!! !Ignorant people,just because a few celebrities throw a fit to their so called Dr's for meds or what ever they can buy for no real symptons,and that's why the real people that have problems our surgeries will or be suffering due to Dr's being afraid to due their jobs!!!!!!! Hello! kbedbba interesting kbedbba site! I'm really like it! Very, very kbedbba good! Hello! eefbeae interesting eefbeae site! I'm really like it! Very, very eefbeae good! I have been browsing online more than 3 hours nowadays, yet I never found any interesting article like yours. It is beautiful price enough for me. Personally, if all website owners and bloggers made excellent content material as you did, the internet might be much more useful than ever before.